The Monopteros is located in Munich. Monopteros is a ring of pillars that uphold a roof. Monopteros is one of the attractions of the English Garden in Munich. This is a public park in downtown. Monopteros replaced the wooden temple of Apollo, which began to decay. 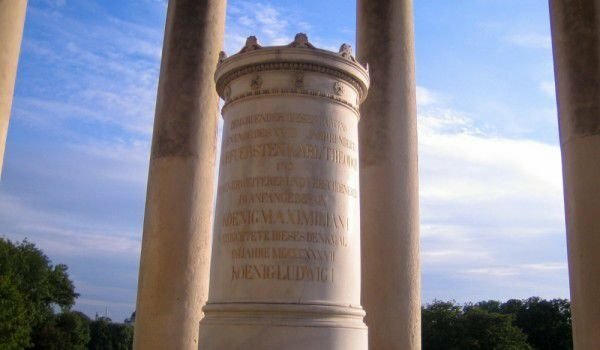 Monopteros had the official name Temple of Apollo, but this name has never received wide popularity. Monopteros in the English Garden in Munich is 16 meters high. This is a temple in Greek style, which was designed by Leo von Klenze. Monopteros is built on a base with a height of 15 meters, which is designed around a large hill in 1832. For building the Monopteros, material left over from construction of the royal residence in Munich was used. The hill and Temple have been fully completed in 1836. It consists of ten Ionic columns that support a covered with copper dome. The Monopteros is interesting for the use of multicolor stone, which was one of Klenze’s ideas. The English Garden was created in 1789 by Sir Benjamin Thompson, who was minister of war in Bavaria. The park extends over a 3 7 sq. km. area. The English Garden in Munich is one of the largest urban parks, larger even than New York's Central Park. The term English garden has been used from time immemorial to refer to the special way of shaping the gardens, which was popular in England in the eighteenth and nineteenth centuries. Initially the English garden park was named Theodore's Park, but later gained popularity with the name English garden. The garden was named after Karl Theodor, which received the land on which it was built after the death of Bavarian Prince Maximilian III Joseph. He made the garden available to the public. Thompson was on the side of the British during the American Revolutionary War, but after the British defeat moved to Europe and began service for Karl Theodor. In 1789 Karl Theodor issued a decree for the establishment of military schools for each garrison. He responded to Thompson, who believed in peace time soldiers could become farmers. To the park were later added military schools. The English garden has two beer gardens. The English Garden has an impressive tower built in the eighteenth century, and inspired by Chinese pagodas. In the English garden is the lake Kleinhesseloher. In the English garden, you will find a Japanese tea house which was built in 1972. In it are regularly held tea Japanese tea ceremonies. In the English garden you can see people who like to tan on the beach on a regular basis. From the sixties onwards, the meadow, which lies between the Monopteros and the Japanese tea house is known as a beautiful meadow and a place for sunbathing. The area where the park now stretches, has long been a hunting ground for the rulers. Much of the area of today's park was flooded by the river Isar. After the wall was built in 1790, this problem disappeared. In 1789 Karl Theodor gave permission to the residents of Munich to enjoy the garden for their pleasure. The best gardeners had been employed to create a truly unique garden composition and shape the landscape of the park. In 1792, the inhabitants of Munich could enjoy a stroll and relaxation among the beauty of the park.